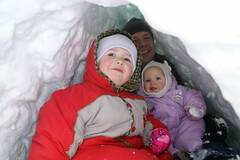 Today Daddy took us girls inside the igloo he made in the garden. It was warm in there and the soundproofing was amazing - we couldn't hear anything that was going on outside. He even convinced Mummy to pop in.